I JUST completed the 1977 Hondamatic for sale that had been in storage for 15 years. I spent the last year on the restoration. The bike's engine checked out 4lbs off factory specs on all four cylinders and it runs great. This motorcycle is very responsive and has just 19895 original klms! This unique automatic Honda motorcycle has a new, red diamond dust paint job, crown lights, spokes, tires, battery, etc. I'm working on getting pictures together to be uploaded. This automatic Honda motorcycle is a classic collectors bike that's been very tastefully restored and runs and looks great! If you would like to tell us what you know about this bike you can do so using the comments form located directly below this ad provided by GoGoCycles Old Motorcycles . 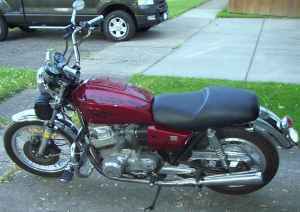 The 1977 Hondamatic for sale is located in Pemberton BC Canada. Price $6000. Call (no e-mail) if you're interested 604 384 Three 003 and don't forget to mention that you found this ad on GoGoCycle's Used Motorcycles and Parts for Sale www.gogocycles.com when you call. Join in and write your own page! It's easy to do. How? Simply click here to return to HONDAMATIC CLASSIFIED INVITATION.